Vivacity provides cutting-edge technology to the transport industry. By working closely with academia, publishing research papers, registering patents, and demonstrating state-of-the-art results, we drive the field forwards. Our goal is to revolutionise transport management. Our work focuses on the intersection between Artificial Intelligence and the Internet-of-Things, using AI “on the edge” to generate insights. Our sensors have on-board Artificial Intelligence to understand road transport. We can apply Artificial Intelligence to your existing CCTV, for live and historic videos. We can provide access to data in cities where we already have comprehensive datasets. Our state-of-the-art prediction approaches based on Artificial Intelligence forecast traffic flows with unprecedented accuracy. Our manufacturing facility in Bletchley, Milton Keynes is where our technicians’ prototype, build and test our sensors using controlled processes. This site was founded in 2017, to produce 2300 sensors for the smart city project through Innovate UK’s “First of A Kind” initiative in Milton Keynes, manufacturing and installing a network of our intelligent sensors able to monitor up-to-the-minute city-wide transport status. our technology in action at our Milton Keynes site. Our technology has been deployed across a huge range of different scenarios and use cases, including on roads, in rail stations, on sports pitches, and on footpaths. In each case, the goal is to gather anonymous data on usage of that space. On the roads, historic aggregations of this data allow our clients to improve transport strategy modelling, using highly accurate data about vehicle movements, with an 8-class classification scheme. Live data is also used to feed into highways operations, enabling real-time load balancing across networks, and allowing operators to understand the current state of their network. As another example, on football pitches, the system extracts information about where there has been most player activity, and compares this to where the pitch has been maintained, in order to direct maintenance schedules and pre-emptively identify likely causes of failure. If a human watching a video feed 24/7 would solve your problem, chances are it can be addressed using our Artificial Intelligence algorithms and hardware systems. Get in touch to find out more. Pedestrian, Cyclist, Motorbike, Car, Van, Bus/Coach, OGV1/Rigid HGV and OGV2/Articulated HGV. We can additionally classify Black Cab taxis as distinct from cars if required. Our sensors are able to track road users across the field of view, giving us an unprecedented level of detailed data on how different road users interact and use the space available to them. We can present this path data in image space, or transform it onto a map of satellite view. We also use the path data to assess vehicle speeds, and provide data on how crowded a road space is. 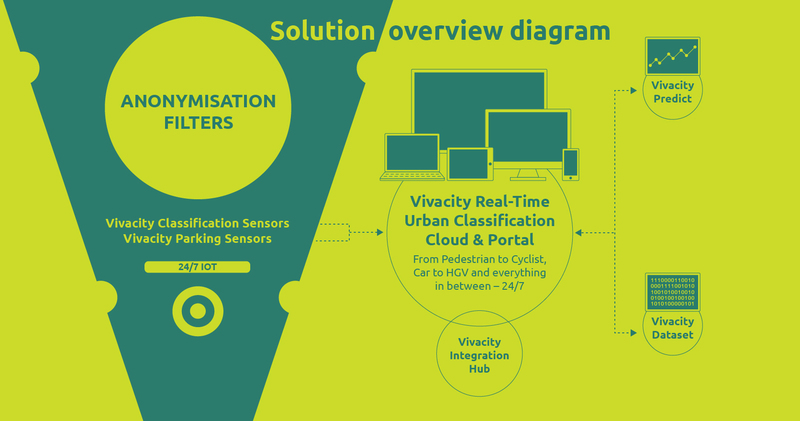 Vivacity have built a Machine Learning based predictive capability which consumes historic and live data about a road network, and uses this to predict traffic levels in the coming minutes and hours. Our system is easy to deploy, as it does not need to be given any additional data on the road network layout. It continues to learn how road usage patterns interact and change over time, meaning there is no need to update the underlying model if changes to the road infrastructure are made, or if road usage habits change. Vivacity are currently developing a UTC System using Reinforcement Learning to modernise the control of traffic signals.